SpiderScribe (free) is a beautiful online tool for creating quick and simple mind maps. It is similar to MindMeister, but unlike its rival mindmapper, is entirely Flash-based. Like MindMeister, SpiderScribe's free plan lets you create up to three mind maps, after which you need to upgrade to a paid plan for $5 per month--again, just what MindMeister charges. SpiderScribe's Flash-based editor is a bit more basic, but it allows file attachments, which MindMeister's free plan does not. SpiderScribe's interface is beautiful and inviting, and creating nodes using the mouse is easy. If you are getting the feeling there's close competition here, you are right. But while both services are similar in essence and subscription model, SpiderScribe differentiates itself on interface. Whereas MindMeister makes it easy to create text nodes, SpiderScribe offers an easy way to embed rich content into your mind maps: The left side of the canvas features a toolbar with large icons for what SpiderScribe calls stencils. There's a text icon (for plain text nodes), an icon that looks like a Word file (for file attachments in general), an image icon, a map icon, and a date icon. Images appear right on the mind map canvas, and are tiny by default, though you can zoom in by dragging the gripper on their bottom-right corner. This gripper is somewhat elusive: It only shows up when you hover over the node itself, so you must look for it. Embedding maps is fun: SpiderScribe plays nice with Google Maps, so you have only to type in the name of a location and a map showing that location will be embedded right into your mind map. Just like with images, the embedded map is tiny at first (as big as a node on your mind map), and can be enlarged as needed. SpiderScribe's date stencils offer a nice way to use your mind map for project planning, and help put it into context. If you're planning a vacation, you could have a date stencil for the beginning of every week, and have images or maps emanate from that stencil, to show what your are planning to do on that week. As long as you're using the free plan, you will not be able to go wild on the image uploads, though: You get a total storage quota of 3MB--not per attachment, but for your entire free account. Once you upgrade to a paid plan, that increases to a more reasonable 2GB. In many ways, SpiderScribe feels simpler than MindMeister: There are no color themes, you can't change the color of links, and most importantly, SpiderScribe does not have a history feature for rolling back changes incrementally--one of MindMeister's strongest selling points. On the other hand, SpiderScribe makes it far easier to give one node multiple parents--with MindMeister, you need to create clunky "relationships," which appear different than the normal hierarchical links. There is no clear winner here: If you are looking for a non-Flash solution, SpiderScribe is out of the question. But if you don't mind Flash, SpiderScribe's interface feels simple and fluid, and the file attachments offered with the free plan, tiny as they may be, are a nice touch. 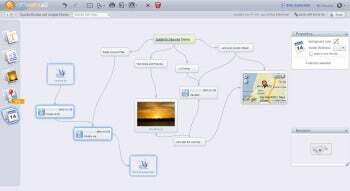 SpiderScribe is a Flash-based simple mind mapping tool with a free plan.